In this study, available open areas are evaluated as an evacuation area in the İstanbul Avcılar district for earthquake. Even though the buildings are not collapsed due to earthquake, it is necessary safe evacuation area in the settlement for after earthquake. Such as parks playgrounds, sport areas and similar open areas in the settlement can also be used as evacuation area for disaster at neigbourhood level. Location in the settlement, using type, size, environmental risk conditions, infrastructure features and accessibility of such as areas is important for ability for disaster evacuation area. In this study, Istanbul Avcılar district is selected for case study area where high damaged was occurred in 1999 Marmara earthquake. In the assessment, Avcılar District disaster information system data, zoning plan, aerial photographs and on-site survey data are used at neighborhood level. According to the results from the study, there is need for capacity improvement in areas which are expected to be used as open evacuation area in case of an earthquake on a neigbourhood level in the district of Avcılar. AB Avcılar Municipality. Toplanma ve Geçici Barınma Alanları. Istanbul: 05.05.2017/ 69384616-663.09-E.325-14067, 2017. AB, Avcılar Municipality. «Plan ve Proje Müdürlüğü.» Kentsel Dönüşüm İşleri. Avcılar: Avcılar Belediyesi 17.05.2017/ 43583371-310.14.01-E.580-15411, 17 May 2017. AFAD. "Açıklamalı Afet Yönetimi Terimleri Sözlüğü." Ankara: T.C. Disaster and Emergency Management Presidency Press, November 2014. AFAD. Müdahale, İyileştirme ve Sosyoekonomik Açıdan 2011Van Depremi Raporu. Deprem Raporu, Ankara: T.C. Disaster and Emergency Management Presidency, 2014. AFAD. UDSEP Ulusal Deprem Stratejisi ve Eylem Planı 2012-2013,. Ankara: AFAD T.C. Disaster and Emergency Management Presidency, 2013. —. "Van Earthquake." AFAD T.C. Disaster and Emergency Management Presidency Web Site. January 15, 2016. https://www.afad.gov.tr/tr/2284/Van-Depremi (accessed May 31, 2017). Anhorn, Johannes, and Bijan Khazai. "Open Space Suitability Analysis for Emergenys Shelter After an Earthquake." Natural Hazards Earth System Sciences, 2015: 789-803. Coburn, A, ve R Spence. Earthquake Protection. İngiltere: John Wiley&Sons Ltd., 2002. ÇŞB Çevre ve Şehircilik Bakanlığı. KENTGES, Bütünleşik Kentsel Gelişme Stratejisi ve Eylem Planı 2010-2023. Ankara: Çevre ve Şehircilik Bakanlığı, 2010. Desinventar. «GAR Global Assessment Report on Disaster Risk Reduction.» Desinventar. 2015. http://www.desinventar.net/DesInventar/profiletab.jsp?countrycode=g15&continue=y (June 17, 2017 tarihinde erişilmiştir). Esnard, Ann-Margaret, ve Alka Sapat. Displaced by Disaster: Recovery and Resilience in a Globalizing World (Disaster Risk Reduction and Resilience). Newyork: Routledge, 2014. FEMA Federal Emergency Management Agency . «FEMA Web Site.» Guide to Emergency Management and Related Terms, Definitions, Acronyms, Programs and Legislation. 2008. https://training.fema.gov/hiedu/docs/terms%20and%20definitions/terms%20and%20definitions.pdf (May 10, 2017 tarihinde erişilmiştir). Gökçe, O, Ş Özden, and A Demir. Türkiye'de afetlerin merkansal ve istatiksel dağılımı afet bilgileri envanteri. Ankara: Bayındırlık ve İskan Bakanlaığı Afet İşleri Genel Müdürlüğü, Afet Etüt ve Hasar Tespit Daire Başkanlığı, 2008. IMM Istanbul Metropolitan Municipality. İstanbul Deprem Master Planı. İstanbul: Istanbul Metropolitan Municipality, Plan ve İmar Dairesi, Zemin ve Deprem İnceleme Müdürlüğü, 2003. IPKB İstanbul Proje Koordinasyon Birimi. «ISMEP İstanbul Sismik Riskin Azaltılması ve Acil Durum Hazırlık Projesi.» IPKB İstanbul Proje Koordinasyon Biirimi. 2006. http://www.ipkb.gov.tr/tr/ismep (May 31, 2017 tarihinde erişilmiştir). JICA Japan International Cooperation Agency. The Study on A Disaster Prevention / Mitigation Basic Plan in Istanbul including Seismic Microzonation in the Republic of Turkey. Final Main Report, Istanbul: JICA Japan International Cooperation Agency- IMM Istanbul Metropolitan Municipality, 2002. Kadıoğlu, Mikdat. « Afet Zararlarını Azaltmanın Temel İlkeleri.» Modern, Bütünleşik afet yönetiminin temel ilkeleri, içinde, yazan M. ve Özdamar, E. Editör: Kadıoğlu, 1-35. Ankara: Japonya Uluslarası İşbirliği Ajansı JICA Türkiye Ofisi Yayınları No:2, 2008. Lagorio, H. J. Earthquakes: An architect’s guide to nonstructural seismic hazards. New York: Wiley-Interscience John Wiley, 1990. Quarantelli, E.L. «Patterns of sheltering and housing in US disasters.» Disaster Prevention and Management: An International Journal, 1995: 43-53. Reuters . « Japan’s Evacuation Centers .» Reuters Web Site. 22 March 2011. http://in.reuters.com/news/picture/japans-evacuation-centers-idINRTR2K7YQ (June 03, 2017 tarihinde erişilmiştir). SBA Shigeru Ban Architects. «PPS set up in an evacuation center, in East Japan on 2011.» SBA Shigeru Ban Architects. 2016. http://www.shigerubanarchitects.com/works/2016_Amatrice_02/index_en.html (May 31, 2017 tarihinde erişilmiştir). Sorensen, John H., ve Barbara Vogt Sorensen. «Community Procesesses:Warning and Evacuation.» Handbook of Disaster Research içinde, yazan Enrico L. Quanterelli, Russell R.Dynes Editor. havidan Rodriguez, 183-199. Springer, 2007. Sphere Projesi. «Sphere Projesi, İnsani Yardım Sözleşmesi ve İnsani Yardımda Asgari Standartlar .» Sphere Projesi. 2011. http://www.sphereproject.org/handbook/ (May 05, 2017 tarihinde erişilmiştir). TMG Tokyo Metropolitan Government. "Disaster Preparedness Tokyo." Tokyo Metropolitan Government web site. 2015. http://www.metro.tokyo.jp/ENGLISH/GUIDE/BOSAI/index.htm (accessed May 21, 2017). Toshikazu, U, ve H Takumi. «Operational Management Regarding Disaster Prevention Parks in Tokyo Metropolitan Parks.» World Urban Parks Congress 2015, 9th Ibero American Congress of Parks and Public Gardens. Parjap, 2015. TUIK Turkish Statistical Institute. «Avcılar İlçesi 2016 Nüfusu Adrese Dayalı Nüfus Kayıt Sistemi.» TUIK Web Sitesi. 2016. https://biruni.tuik.gov.tr/medas/?kn=95&locale=tr (May 22, 2017 tarihinde erişilmiştir). UN United Nations. «Sendai Framework for Disaster Risk Reduction 2015–2030.» UN United Nations web site. 2015. https://www.unisdr.org/files/43291_sendaiframeworkfordrren.pdf (May 21, 2017 tarihinde erişilmiştir). UNISDR United Nations Office for Disaster Risk Reduction. «Terminoloji.» UNISDR United Nations Office for Disaster Risk Reduction. 2017. https://www.unisdr.org/we/inform/terminology (October 10, 2017 tarihinde erişilmiştir). Yücel, Gül. Earthquake and Physical and Social Vulnerability Assessment Model for Settlements:Case Study Avcılar District. Unpublished PhD dissertation (in Turkish), Istanbul: Yıldız Technical University, Graduate School of Science, Engineering and Technology, Department of Architecture., 2009. ISNAD Yücel, Gül . "Earthquake and Evacuation Area Assessment for Istanbul Avcılar District". 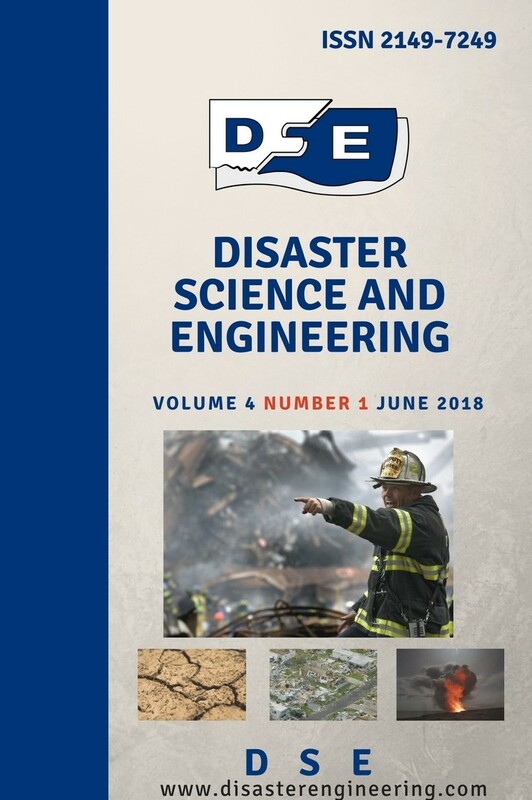 Disaster Science and Engineering 4 / 2 (December 2018): 65-79.